We may be planting in a post-wild world, but all the things we love about nature and the natural world are still the things we need and should be planting in our landscapes today. Thomas Rainer spoke to a full house Sunday at the Manassas Community Center, delivering a message that spoke right to the hearts of the sold-out audience. The event was planned by the VNPS Prince William Wildflower Society Chapter, and co-sponsored by the Prince William Conservation Alliance, and the Prince William Master Gardeners. The City of Manassas Park graciously provided the facility free of charge. Design help needed. Gardens must be beautiful and self-sustaining. Photo of Rainer slide. 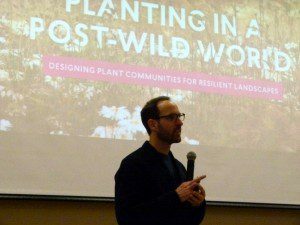 Thomas, a practicing and successful landscape architect, noted that the advocacy for the use of native plants has been amazingly successful; where we are falling down, in his opinion, is in the installation of sustainable and attractive gardens. 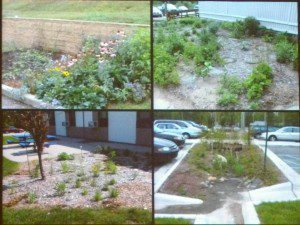 Too many of the celebrated new public spots, rain gardens, pollinator gardens, and others, suffer die-off, or fail to thrive and become unsightly. The plants themselves are then unfairly blamed. Looking at the stressful places, extremely hot, cold, wet, and dry where plants not only survive but thrive, we have to admit it’s not the plant’s fault when this happens. “We cuddle our plants with mulch, water, weeding, etc., but that’ s not how they grow – those are punishing stresses,” stated Mr. Rainer. Plants are sociable, he explained. Observing plants in a natural setting you see that in most situations they prefer to grow right up next to each other. They grow to share space horizontally, vertically, and underground. They provide support, shade, and shelter for one another; they grow in communities, not in isolation. We must make the effort to understand this type of community planting and utilize it to the benefit of plants and people alike. A plant’s job is to cover the soil. Spacing so that plants can touch each other is not only more beneficial to the plant, but also far more attractive than looking at swaths of brown mulch. 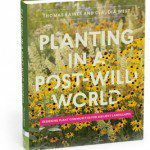 Thomas likened pruning and mulching to acting as chaperones at a dance – to prevent plants from interacting! Photo of Thomas Rainer’s slide. 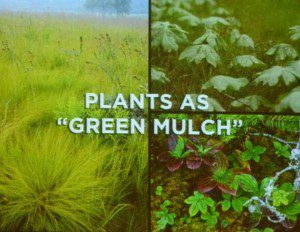 Closely tied to the concept of plants as ‘green mulch’ is the need for the right kind of diversity in the layer closest to the ground. Look under the leaves of a planting in the wild, Thomas said, an you will see a whole layer of little plants filling the interstitial spaces between the larger plants, occupying a unique space where they thrive and also perform important functions needed down there; preventing erosion, keeping temperatures even. Thomas shared many practical pointers for getting started on garden design plans. Above ground, there are three layers to think about: the structural; the mid-layer, or seasonal layer; and the groundcover mentioned previously. The structural level comprises the fewest plants; these are the trees, or in a small garden, the taller shrubs or wildflowers like Joe pye or Heliopsis, and are planted first. The seasonal layer, where the colorful blooms may appear has the most plants, and is planted along with the groundcover. 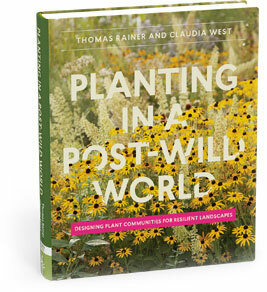 His book, Planting a Post-Wild World: Designing Plant Communities for Resilient Landscapes, is the go-to source for a full explanation, beautifully presented with photos, plant lists, diagrams and a literal wealth of information about how to put the plants together in communities that will thrive. Thomas spent some time expanding on his ideas relating to design, one of the elements that may the most difficult for many to tackle. His inspirations come from the experiences he cherishes in the wild. The patterns, colors, shapes, and textural interest we love in wild places are things we can’t truly mimic in small landscapes, but they are elements that can be interpreted and amplified there. He gave an analogy of a mountain peak painted by Cezanne, showing how the artist had captured those essential elements, but without all the detail revealed in the photo of the actual object. More help in the book! Our deep connection to the pristine and wild places we came from remain an integral part of our consciousness, Thomas posits. The joy and peace, and the excitement we feel in those places are things we now need to incorporate in our gardens and landscapes. Horticulture is experiencing a Renaissance, he said; it is no longer about decoration. 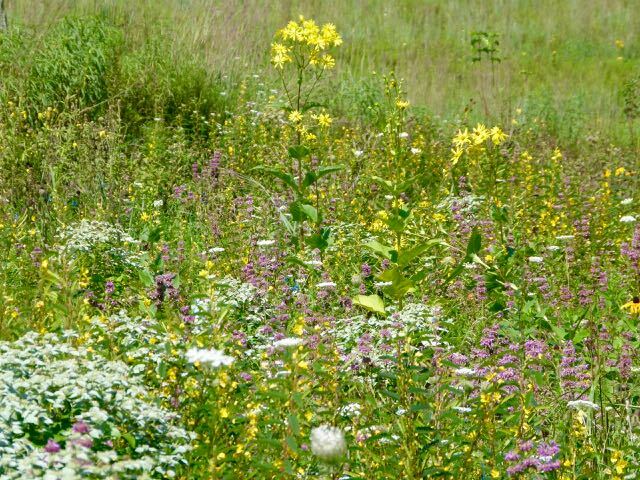 We may have lost the pristine places, but why not have meadows on our skyscrapers, use wetlands to purify our water, design planted overpasses on our highways to connect forests. We need designers and gardeners to create the reconstruction of the natural world, and plants will be at the center of it all. for Resilient Landscapes, by Thomas Rainer and Claudia West. Cathy, it is not too late to put something in until the ground freezes! Knowing nothing of your location or growing conditions we suggest you take a look at the native nurseries listed under “Growing Natives” on our menu bar and find a nursery near you where you can speak with someone who can give specific help. Also check out the “Interactive Plant Finder” under the same tab. You can make selections on these based on your own conditions.